They started warning of a storm on Sunday, by Tuesday excitement was crackling, kids and parents alike were talking about backwards pjs and upside down spoons to help the storm along. It look incredibly flat and unremarkable to me. I kept the girls’ excitement in check with mild clucking and, “I don’t know girls, it doesn’t look very snowy.” They begrudgingly did their homework, but not before making me promise that they could go skiing with Sean if school was, in fact, cancelled. “Sure, but only if you get a good night’s sleep, ok?” I warned. “Oh yes, mom. It is almost like a not school night and we promise we’ll sleep,” Fin thrust her hands at me, fingers laced together in a campy fist of prayer. I tilted my head to the side and Ave said, “You know mom, when we’re all together everyone sleeps better, even you, right?” I caved. They gave it a go, but by 10 they were each in their own bed. I spent the night peering through the window on the hour; despite having a full load at work, there is an infectiousness to wishing on a snow day. It didn’t come as early or as forcefully as the forecasts had called for, but by 5am school had been cancelled. The girls scampered in for the iPad and gushed about the skiing they’d do. I smiled, there is a gratitude that comes, no matter how inconvenient the circumstances, when the universe breaks from its routine and let’s us taste the ghost of being seven. My heart sank. They’d all been so excited, Sean included. I tried to manage the landslide of emotions—frustration that I couldn’t take the pressure off Sean, grateful that he had the work ethic to ignore the foot of fresh powder, confusion about being a parent and a business owner and how they all too often seem to be completely at odds, dread at telling the girls that despite their wonderful behavior that there would be no skiing. “Hey mom. Is it time? Will Dad be home soon?” Briar asked, her hair dipping past her shoulders and her face surprisingly angular. Is she really just nine, she looks 12. “We cleaned our rooms and brought the laundry down,” Finley declared, the hem of her jeans hovered over her feet. Not a week ago they pooled at the floor. Ave watched me mournfully; her enormous eyes already registering the words I hadn’t said. “Girls, I’m sorry. Dad can’t come home. He has to stay and finish his projects.” They gasped and their shoulders dropped. They swallowed any, “but you saids” as their eyes filled with tears. As they thundered off to get their clothes I thought about what was next. My back hissed at me in warning. I reminded myself of what I can and can’t do, then I thought about Sean and decided that I could do a tiny bit more. I would shovel the heavy wall of snow the plows had thrown that blocked our driveway. I’d shovel the walk. This way when he got home he’d have a few less things to tend to in the dark. I smiled as the girls bellowed at one another as they tried to find their gloves and hats. Ninety minutes later the big girls were swinging from trees and Finley was following me around with a lime green beach shovel, each path I’d clear with the snow shovel, she’d trace with her own. “I’m going to be just like you when I grow up mama. Yep, I’m going to love my children and never say mean things, ‘cept when they’re bad, but it won’t be mean, just ‘stricture’. And I’ll be a worker, cooker, lover mom.” A sob hiccuped in my throat and then my phone thrummed in my pocket. 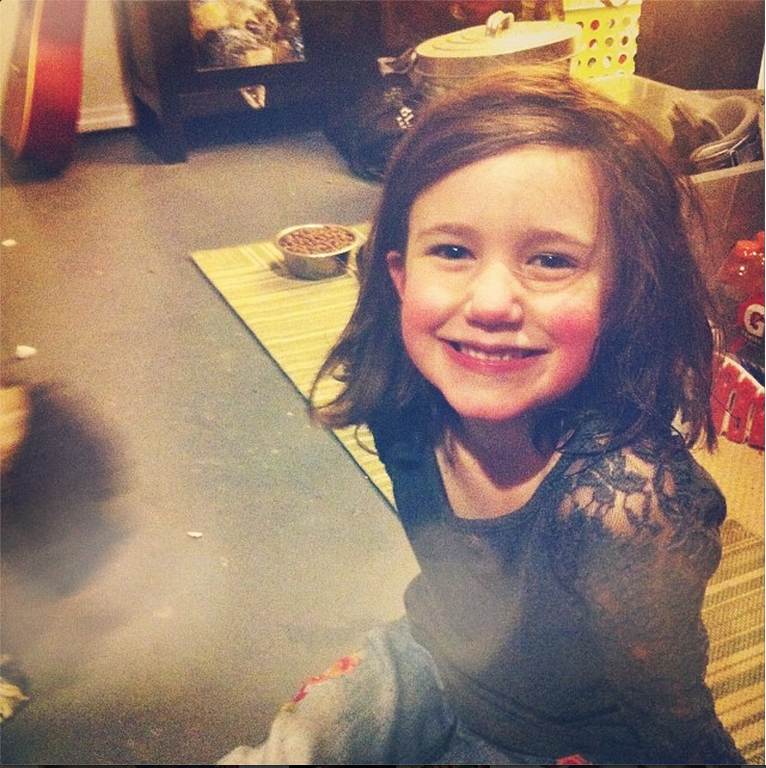 We walked up to the garage to help her sisters get dressed; they were breathless. I wondered about sledding, this was going to be Fin’s treat, but was it fair? If I wasn’t exactly excited, did it mean that I wasn’t really having a date with her? Does having to cajole myself into pretending to like being out in the snow mean that I’m not really in the present? Mostly I wondered why on earth do we have to grade every action on its level of genuineness or presence in the moment. “Mom, can we go on the big one together first?” She was looking up at me, goggles cockeyed and her nose red as could be. When Sean left with the big girls, Finley and I chased the headlights with our sled. The plastic tobaggan shot down the driveway cutting through the fresh snow. Sean cheered out the window and Finley raised her fist in triumph. We spent an hour hurtling down the hill, the trails we left making an octopus shape on the hill in our front yard. I’m not sure when I stopped analyzing the activity and started riding behind her like a seven year old, but I did. When we finally called it a night, we were both deliriously happy. We kicked the snow off of our boots until the basement floor looked like meringue. We laughed at each other’s hair and declared it the best sledding date ever. I do not like being out in the snow, but this made me want to grab a sled and venture out. And I love the “worker cooker lover” part. I can’t see your life or your girls in the flesh, but I think I know enough to safely say, you are a great mom, Amanda. And a fabulous writer, of course. Thank you, Shannon. You set a beautiful tone for my day with this comment this morning! This inspired. I often let (make?) my husband do all the outdoor stuff because it’s just not my thing. But I know I miss out on some of that good play. It’s so worth it. I am always amazed at how this thing I “do for them” ends up being something that really is for all of us! This is incredibly beautiful. What a good mom you are and what sweet girls! Oh phew! I’m so glad it worked out!